You never have to worry when you purchase a POP Design product. We always have our customer's back and we will do everything to make you happy with your purchase. To get you started, we offer a 2-year replacement guarantee for our Bluetooth earbuds. If you experience any issues with these headphones, simply reach out to us and we will make it right! BEATS ANY WIRELESS BLUETOOTH HEADPHONES ON THE MARKET: POP Design wireless sport headphones are the reliable, comfortable and affordable earbuds that you have been waiting for! Our bluetooth headphones feature a strong 30 ft. range on top of many other features allowing you to forget that you are wearing them. Oh, and thanks to high fidelity acoustics they sound amazing too - no need to pay Bose prices! Compatible with all devices such as iPhone 7, iPhone 8/8+/X, Samsung Galaxy and more. SECURE, ADJUSTABLE FIT: POP Design wireless headphones are ultra-lightweight, ergonomic and are specifically designed to be worn during exercise. The neckband secures the headphones during running and allows the headphones to rest over your shoulders when not in use. Includes a total of 18 (3 sizes that come in 3 colors each) gel flex earbuds so that you can adjust the look and feel as needed. Also included comes a cord manager and a travel case to keep you organized on the go. HIGH RANGE BLUETOOTH: The built-in bluetooth technology allows you to smoothly connect to up to two devices up to 30 feet away. 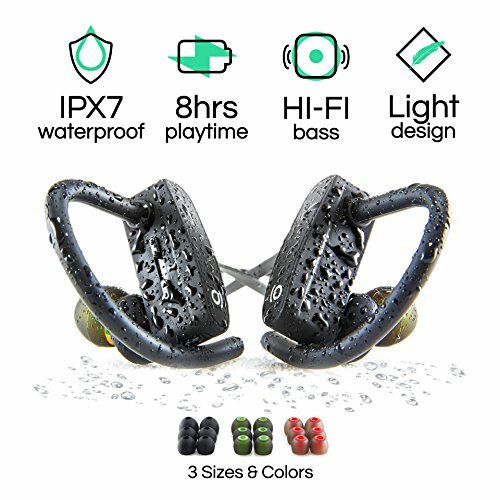 This strong connection allows you to enjoy the incredibly crisp sound, deep bass and clear treble coming from the high-fidelity sound system without interruptions. Our sports earbuds are also equipped with a durable li-ion battery that lasts for up to 8 hours and recharges quickly. FEATURE LOADED: Here at POP Design, we always aim to make things a bit better than expected. For our wireless sport headphones, we added a range of useful features such as voice prompt capability, a built-in microphone and an IPX7 waterproof casing. Additionally, CVC 6.0 noise reduction technology will suppress background noise while increasing the voice quality during your phone calls so that you can focus on the things that matter to you. QUALITY BACKED BY GUARANTEE: We always thrive for 100% customer satisfaction. That's why offering a 2-year warranty for our Wireless headphones was a no-brainer for us. If anything is not to your complete satisfaction, simply reach out to us and we will make it right! Guaranteed. If you have any questions about this product by POP, contact us by completing and submitting the form below. If you are looking for a specif part number, please include it with your message.